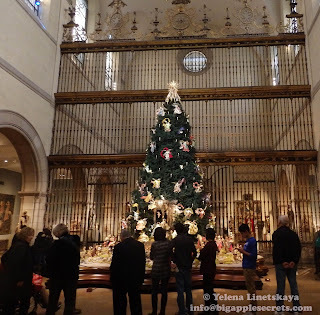 A 20-foot tall spruce tree, decorated with 18th century Neapolitan angels and cherubs and groups of crèche figures recreating the nativity scene stands in the middle of the Medieval hall in the Metropolitan Museum of Art. 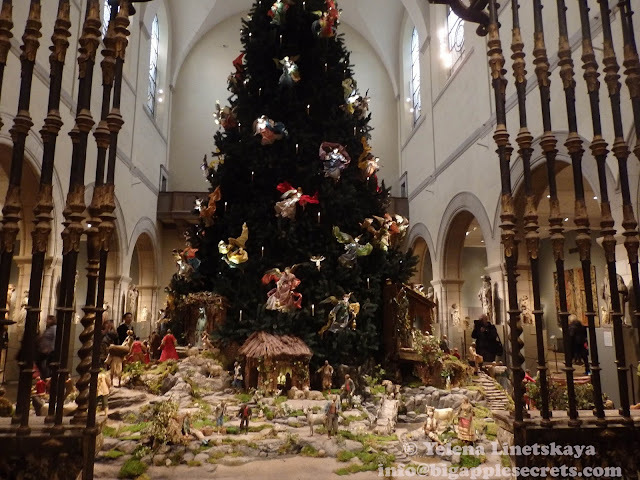 The tree is located in front of the eighteenth-century Spanish choir screen from the Cathedral of Valladolid, Spain. The screen was erected in 1763 and painted and gilded in 1764. 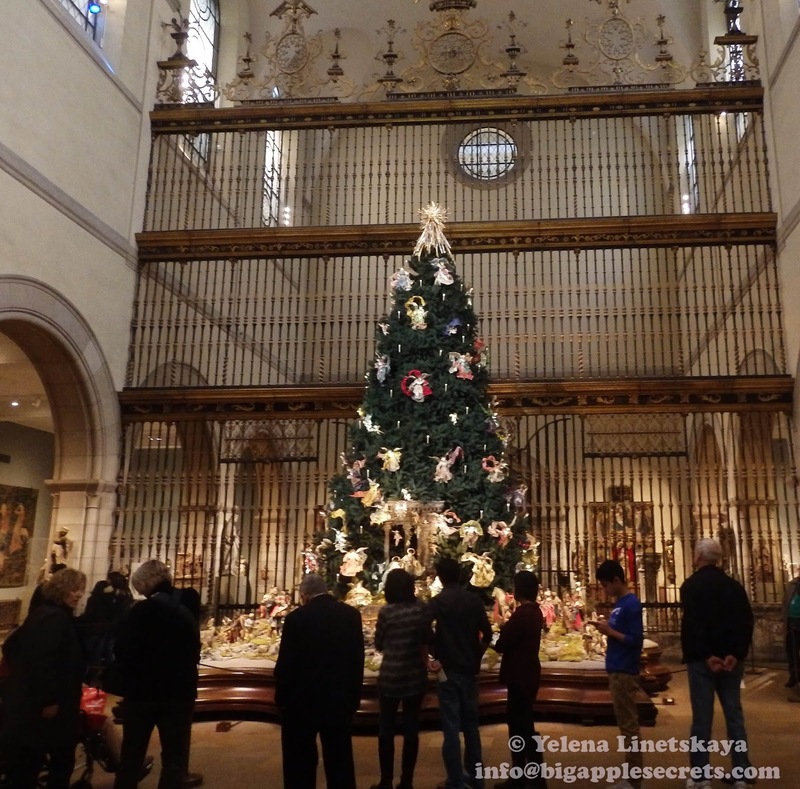 This tree is a holiday tradition at the museum, and it’s become a favorite with both New Yorkers and visitors alike. 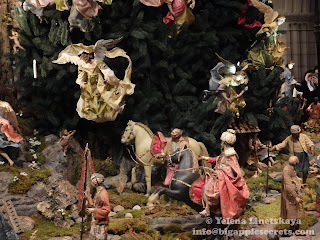 There are twenty-two cherubs and fifty-five gracefully suspended angels on the tree .The lights on the tree are strategically placed to illuminate their faces. The lighting in the tree room is intentionally kept soft so that the colors on the aging fabrics of the figurines doesn’t dull. That's why flash when making pictures is not allowed. At the base of the tree there are various buildings, villagers, shepherds and the three Magi. 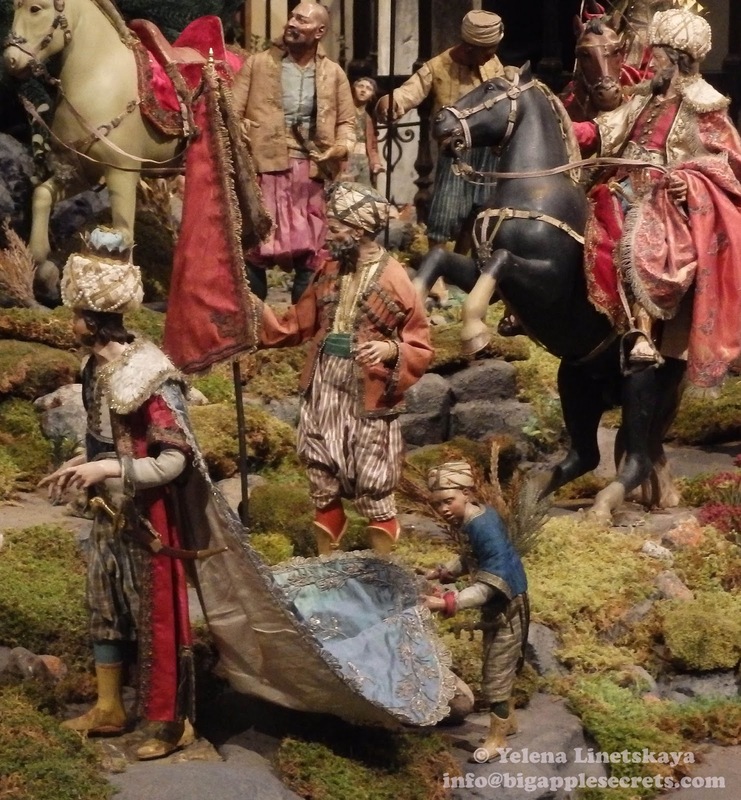 There are 69 sixty-nine figures that represent the three elements of Nativity scenes traditional to eighteenth-century Naples: adoring shepherds and their flocks, the procession of the three Magi, and colorful peasants and townspeople. The crèche figures range from 6 to 20 inches in height and the details are stunning. Some of the figurines in the Neapolitan Nativity scene date to the 1700s. 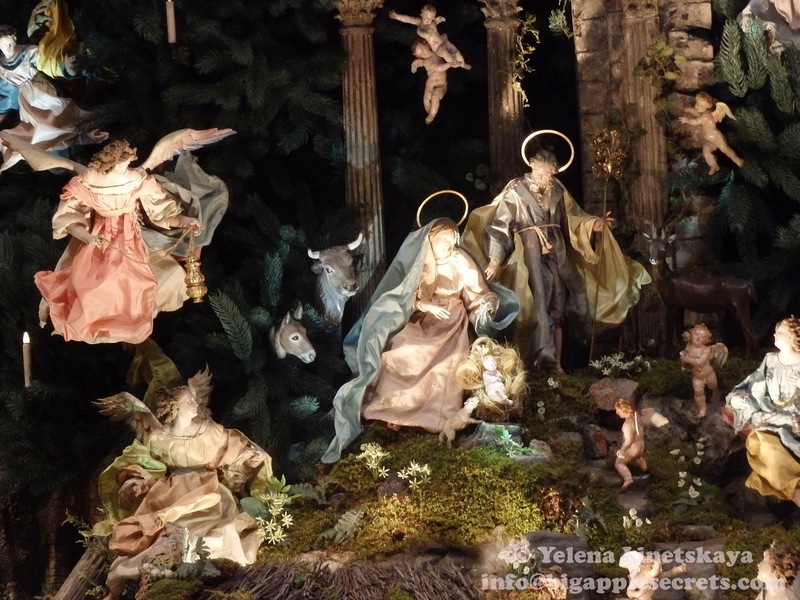 Nativity scene is the oldest and most recognized traditional icon for the Christmas season. St. Francis of Assisi was the first to introduce the use of the three-dimensional nativity scene to Italy in 1220. The tradition reached its cultural peak in 18th century Naples, Italy. Crèche figures were an obsession in Naples during the 1700s, and families staged spirited get-togethers each year to see who could create the most impressive scenes. When Don Carlos of Bour­bon (the future Charles III of Spain) ruled the port city from 1734 to 1759, he reputedly owned a collection that numbered almost 6,000. The figures on the tree come from a collection by Mrs. Howard, whose father, Edward Hines, was a lumber baron in Chicago. Loretta Hines Howard started collecting the figurines in 1925. Collaboration with the Met in 1957 marked the first exhibit of Howard’s crèche figures set around a Christmas tree. Loretta began donating the figures to the Met in 1964. 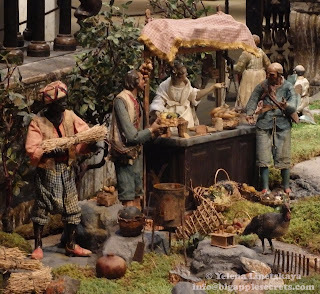 Every year since, the Howard family has come to the museum to oversee the installation of the elaborate panorama, featuring the Holy Family surrounded by Magi, shepherds, and townspeople. Loretta died in 1982, and her daughter Linn has continued to acquire new figures. The museum declines to discuss the collection’s value, but a curator, speaking anonymously, says that one figure in good condition, with original costumes, can bring as much as $12,000 to $16,000 at auction. In keeping with family tradition, Linn Howard's daughter, artist Andréa Selby, joins her mother in an important guiding role to create the display. 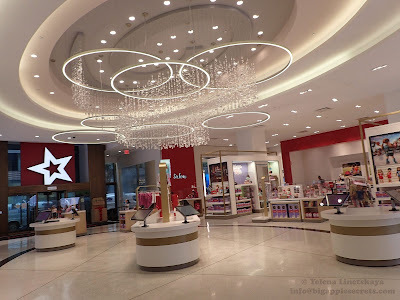 The tree is on view till January 6, 2016.